There have been a lot of comparisons between this book and Harry Potter, as well as the Jungle Book. I have to say that I liked Bod a heck of a lot more than Harry or Mowgli. 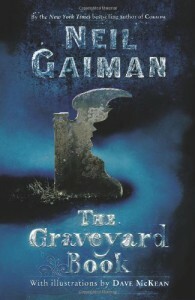 I can't count the number of times I had a *facepalm* moment while reading the Harry Potter books- Oh, Harry Potter, No!With Bod, They were few and far between and even then, I felt more in tune with his decision making process and his path than I ever did reading the Jungle Book.I loved the language Gaiman uses. I actually listened to this book via his website- the entire book is posted there in chapters from the book reading tour he had in October. A part of what really sold the story for me was his use of accent and langue while reading but the words themselves painted such a full and powerful picture for me.I adored the ending. It felt like a beginning for Bod, a sense of moving from one world to the next. It's as if Bod was living life backwards- starting out in the graveyard, then leaving for the rest of the world.Some have commented that we did not know enough about the Jacks, that their motivations weren't clear enough, that what Silas did to fight them was too vague. I have to tell you, I was glad for it. I hate all of the conspiracy theory baloney that authors have tried to use (Yes, I'm even talking to you, Rowling). I liked the idea that no one was willing to monologue their backstory, that it wasn't really the important issue in the long run.The story was about keeping Bod safe so he could grow up and live. That's what Silas and the others did. This really touched me and I wasn't expecting it to. I was left longing for more story- not that what I had read wasn't enough to fill in all the blanks but that I wasn't ready for Bod to go away yet. I could have spent more time with him and Silas and Scarlet.I have this image in my head of Bod traveling the world, touching all the paths that he can and eventually running into Scarlet again.This book reminded me, now that I really think about it, of Stephen King and Peter Straub's "The Talisman", in terms of how real and honest the main hero was. And because of that, I am hoping for (no matter how unlikely it is) for a sequel much like "The Black House," where we find out hero grown and living and finding more adventures in his life.